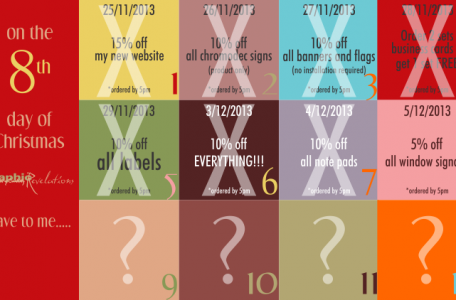 On the 8th day of Christmas Graphic Revelations gave to me….. 5% off ALL WINDOW SIGNAGE! Merry Christmas from Team Graphic Revelations THE SMALL PRINT: You must redeem this gift by 5PM to qualify. This gift will not be repeated. You cannot use this gift in conjunction with another promotion. 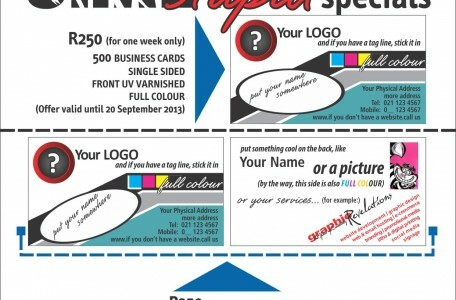 cheap business cards ONE week only! 500 Business Cards – single sided full colour WITH UV varnish – R250 500 Business Cards – double sided full colour WITH UV varnish front only – R350 Offer expires 20 September! Artwork R95. Prices exclude 14% VAT Not based in Cape Town? Don’t worry! We deliver ANYWHERE in south Africa!